A friend of mine had one of those BMW bubble cars. The brakes were poor, so he 'fixed' them. He then discovered another instability of a tiny three wheeler. He applied the 'fixed' brakes hard, when going down a steep hill, the bubble car pitched over forward and rolled to the bottom of the hill. My friend, Paul, was not wearing a seatbelt and spent the next few months in hospital with a broken pelvis. He said it was like an egg in a shoe box. The pictures I posted of the model three wheeler Morgan has really stirred up some good motoring stories, I'm enjoying them all. Many years ago I was following a Robin Reliant three wheeler down a long hill when it clipped the kerb, shot across the road and through a hedge. When I, and several others got there, we found a rather bewildered elderly lady sitting in a pile of shattered fibreglass, fortunately without serious injury. About all that remained intact from the car was the chassis and engine. I was still at school at the time, but I made my dad a car trailer out of the front axle, and myself a motorcycle with engine part. 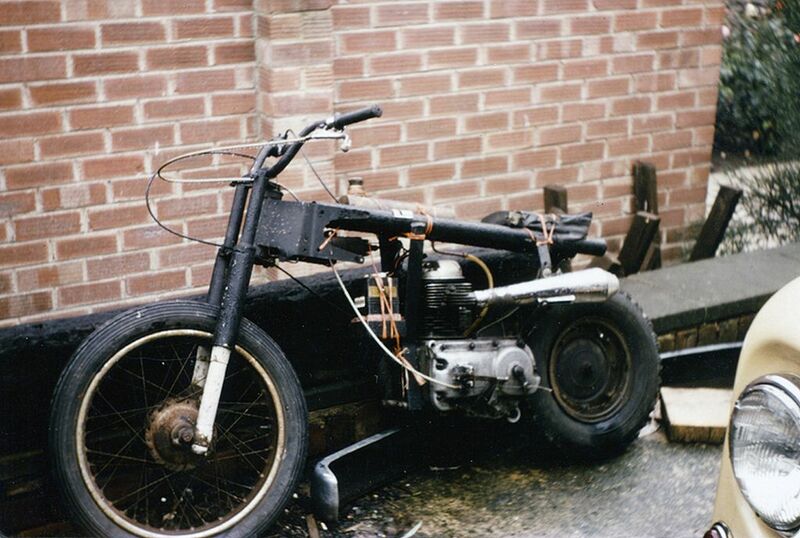 My parents were adamant that I was not buying a motorbike so I cobbled this together one afternoon when they were out. My first memories of being in a motor car were of the tonneau flapping around my ears as dad drove his last Morgan F 4. Sadly my sisters arrival made it unpractical. His first Morgan 3 wheeler was powered by an Anzani " V " twin with magneto ignition and no electric start. No reverse gear either. Apparently you pushed the car forward from outside and then jumped over into the seat to " bump " start it.
" works " carried out certain tweaks to his design for the hill climb events he participated in. Dad said the only vehicle on the road that could keep up with his Super Sport was the Ford V 8 Pilot, but that was on the straights.... Nothing could be seen in his rear view mirror once a bend in the road appeared!! Don't forget, you sit " in " a Morgan not " on " it. I looked after 4 or 5 Isetta bubble cars. Rebuilt the engines etc. Still have a spare gearboxand genuine BMW manual for one. Perhaps I should try putting them on Ebay. Remember my mate breaking down one evening in a really upmarket area on his way from Midlands to High Wycombe. He called me out and I drove down in my Anglia 105E. We slept in my car overnight and next morning I stripped the engine down at the side of the road. After a few hours I had it working, but throughout the morning we had breakfast brought out to us and numerous cups of tea. I do not think the locals had ever seen a Bubble car let alone the engine in bits at the side of the road. I used to keep a spare bodyshell and chassis on the roof of my dads garage, spare engines, gearboxes in the loft. All I can add is the engines for Morgan's new 3 wheeler's are made here in south west Wisconsin. And at work we have rebuilt quite a few rear shocks for the 4 wheelers. Jo, I had a thought you may delve a bit deeper into the Morgan model, when I took that picture the owner was no where about in the model tent, I would have liked a chat with him about his model, thanks to you I now know a little more about the model.